Compared with the T18, the T82 has good speed and an excellent view range, but no armor. 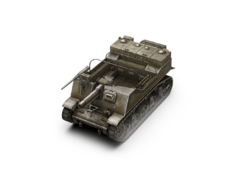 With this tank you have the choice of three guns: the deceptively excellent 57mm Gun M1 L/50, which is good for sniping due to a high RoF which results in high DPM. 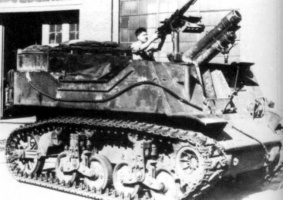 The 105mm howitzer deals massive damage penetrates a bit more armour than the stick 75mm howitzer but is balanced with poor accuracy and a long reload time. However, it can one-shot most Tier 3 tanks and cause massive damage to the ones it cannot one-shot. The T82 should be played from far, even with the howitzers, as you lack armor and you will be better of playing in the secondary lines. The T82 leads to the T40 and M8A1. The T82 is an extremely different approach to combat compared to its earlier parent the T18 in terms of armor and firepower. Where the T18 was sluggish to turn and had thick armor for its tier, the T82 is extremely fast and has a remarkable traverse speed, but only has 13mm of armor for protection. However, don't let the lack of armor dismay you, as this tank can be a blast to use even in a stock configuration. The tank starts out with the 75mm gun, which if you used on the T18 will still pack a relatively good punch until upgraded. The two other choices will be the 105mm howitzer or the 57mm gun. The 105mm can one shot almost all tier 3 tanks and most lightly armoured tier 4 tanks, and is definitely something you'll want if you're more Derp-oriented. However, the 105mm has a slow almost 20 second reload time, has a moderately slow aiming time, has bad accuracy when dealing with long-range shots and okay accuracy for close to medium-range shots, and fires a very slow moving projectile. Good timing is key, and close shots are helpful in this respect. If you're playing as a close-up tank destroyer you need to get in the first shot as you may not survive the return fire with your virtually non-existent armour and meagre amount of hit points. However, if you're playing more of an artillery-style game, you'll likely be hiding behind a bush a good distance away. Take your time aiming, because you only get one shot at an exposed, unsuspecting enemy. As the shell has low velocity it arcs enough to take into consideration, and enemy tanks just peeking their turrets above cover are actually more exposed than they look. A relaxed enemy is where you can get a one-shot on even medium tier fours with exposed sides or rears. Remember, even if your shot doesn't penetrate it can still take a good chunk of hit points from your enemy if it hits right. The turret is a good place to aim, but tracks will take most of the brunt out of the shot. On the other side, the 57mm gun provides a different play style. The 57mm gun is extremely accurate, fast firing, and is well suited for long range support. Its penetration is so well that it will be able to realiably penetrate and damage any tank it should face, including the KV-1 from the front, even if it doesn't do much damage per shot for a tank destroyer. Both guns have different play style and are entirely up to you to decide, and both guns are considered overpowered for tier 3, making the T82 arguably the best tier 3 TD or blitz-style artillery. As an interesting trait, the gun sits high to the point where it almost forms the top of the tank's silhouette, making any form of cover that you can shoot over very effective in protecting the vast majority of your tank if used correctly. This could come in handy where you are trying to protect a lane of approach, since you cannot rely on bouncing any round at all and trying to dodge all of the enemy fire would render your ability to return fire hampered if not eliminated due to the hull mounted gun. Also remember that you are EXTREMELY vulnerable to enemy TD's. Your low hit points combined with low armour and big silhouette make you a prime target for opposing T82's, M2 Medium Tanks, the occasional Hetzer, and Marder IIs. Be careful when shooting from behind bushes, as you are instantly spotted and a quickly turned turret could be your end. The Continental R-975-C1 engine carries over from the T18. mount it immediately. Researching the upgraded suspension first is a good place to start since it's cheap. Next, take your pick between the two guns, the 105mm Howitzer or 57mm gun. This page was last modified on 29 May 2018, at 03:39.